In the run-up to Election Day, at least two Michigan television stations pulled political ads promoting false claims about the state’s ultimately successful marijuana legalization measure, cannabis reform advocates told Marijuana Moment. The ads, paid for by prohibitionist committee Healthy and Productive Michigan (HAPM), attempted to stoke fears about legalization, incorrectly claiming that the initiative would allow for “unlimited potency” cannabis products. “Legalized marijuana allows ice creams, cookies and candies with unlimited potency, making its way into our schools and playgrounds, putting the lives of our children and grandchildren at stake,” the ad states. 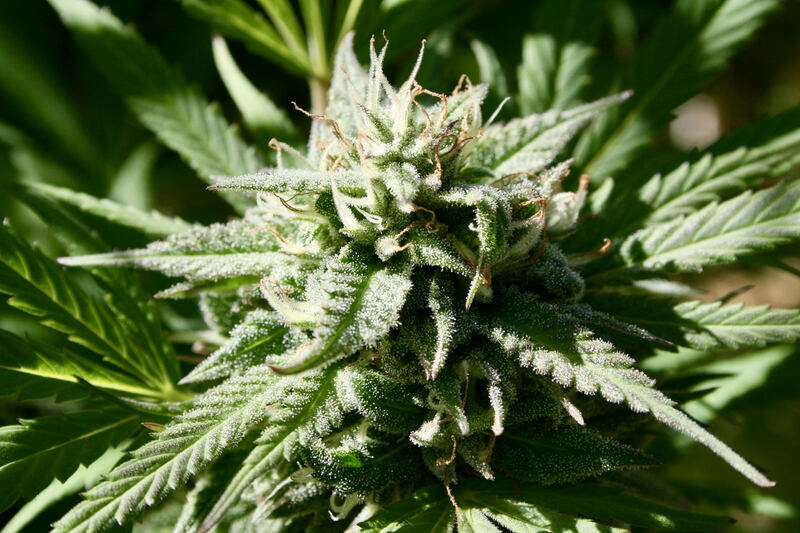 But that claim was fact-checked by the pro-legalization Coalition to Regulate Marijuana Like Alcohol, which raised the issue with television and radio stations where the ads were being run. Two stations—WWMT and WPBN—decided to pull the ads, according to committee treasurer Matthew Schweich, who also served as deputy director for the national Marijuana Policy Project. The paid-for ad spots were seemingly then filled by another one of HAMP’s ad, which features former Denver Mayor Wellington Webb encouraging a “no” vote on legal cannabis. Much of the footage appears to be from the same shoot that prohibition advocates used in advertisements against Arizona’s 2016 marijuana legalization ballot measure, suggesting that opponents of the Michigan proposal were in quite a scramble to find a replacement for their state-specific ad that TV stations would no longer air. All told, the anti-legalization committee spent about $340,000 on broadcast television ads—in addition to another roughly $350,000 on cable television ads—and the two stations that pulled the spot in question accounted for about one-third of the total over-the-air spend, according to Schweich. Marijuana Moment reached out to the anti-legalization committee—as well as prohibitionist group Smart Approaches to Marijuana, which provided significant contributions to HAMP and also promoted the ad—for comment, but did not hear back by the time of publication. The “unlimited potency” ad wasn’t the HAMP’s only attempt to persuade the public to vote against full legalization in Michigan. In another ad, the group’s president makes misleading claims about the impact of reform on traffic safety, falsely conflating active impairment from marijuana with the presence of cannabis metabolites in drug tests, for example. And then there were a handful of generic anti-legalization ads like this one that relied chiefly on fear-mongering. Representatives for the Sinclair Broadcast Group, which owns both Michigan television stations, also were not immediately available for comment. Michigan voters approved the marijuana legalization measure by a sizable margin on Election Day. This story has been updated to clarify figures for HAMP’s TV ad budget. Ben & Jerry’s wants to remind people this 4/20 that hundreds of thousands of people are still getting arrested for non-violent marijuana offenses. As a growing number of companies compete to win over consumers with weed-themed promotions and social media gimmicks surrounding the cannabis holiday, the ice cream giant is pointing out ongoing racial disparities in marijuana enforcement—including in states that have legalized it. The blog goes into detail about racial disparities in the legal industry, disproportionate arrest rates in states like Colorado and also notes that while Republican former House Speaker John Boehner’s stance on cannabis has evolved—from prohibitionist to marijuana firm board member—it also reflects a problematic willingness to profit off the legal industry without recognizing the criminal justice reform work that’s still to be done. Ben & Jerry’s is calling on Congress to expunge the records of individuals with prior marijuana convictions and pardon anyone “whose only crime was possession of cannabis.” The company is also applauding city officials who’ve proactively expunged marijuana records and prosecutors who’ve announced that their offices would no longer be pursing low-level cannabis crimes. To that end, the company is teaming up with San Jose marijuana dispensary Caliva, which is donating 4.20 percent of profits from 4/20 sales to support Code for America’s effort to automatically expunge past cannabis convictions. 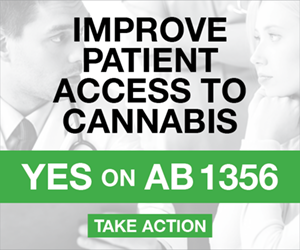 They’re also linking to a petition that people can sign to show their support for comprehensive marijuana reform and, to sweeten the deal, they’re offering a a free pint of their “Half Baked” ice cream blend to anyone who orders a cannabis delivery from Caliva. “At this point where a company can’t just invoke 4/20 for laughs or give lip service to social justice, it’s great to see a campaign use the holiday to call attention to concrete solutions around ‘cannabis justice,'” Shaleen Title, who holds the social justice seat on the Massachusetts Cannabis Control Commission, told Marijuana Moment. Meanwhile, other mainstream brands are launching 4/20-themed campaigns of their own—most of which don’t address the historical harms of prohibition enforcement. Fast food chain Carl’s Jr., for example, is hoping to turn out the 4/20 crowd in Denver by selling a burger with CBD-infused sauce on the marijuana holiday. The burger will cost $4.20 and all of the proceeds will go to…the company. While that move caught plenty of media headlines—in part because the Food and Drug Administration has repeatedly said that adding CBD to the food supply remains prohibited—Carl’s Jr. is far from alone in its overt campaign to leverage the holiday without addressing the inherent privilege it represents. Pizza Hut is offering a Triple Chocolate Brownie for $4.20 on Saturday. 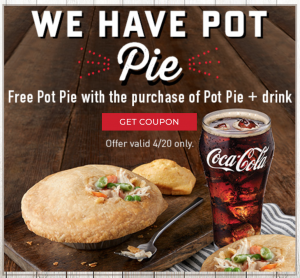 Boston Market is offering a promotion surrounding…pot pies. GrubHub analyzed its own sales data to show what food items were the most popular on 4/20 before and sent out an email blast on the findings. Ridesharing service Lyft—in a promotion that at least advances a harm reduction message—announced that it is offering a $4.20 credit for a single ride in Colorado and various select cities throughout the U.S. and Canada where marijuana is legal—similar to what it did last year. Increasingly, advocates and some lawmakers are growing frustrated by the country’s lighthearted, or profit-driven, attitude toward cannabis reform. Sen. Cory Booker (D-NJ) no longer wants people to talk to him about legalization without making restorative justice for those harmed by prohibition a key part of the conversation. Congressional Democrats also held a panel at a recent policy retreat that centered on social equity in the cannabis industry. That marijuana should be legal was regarded as a given, but more to the point, a legal system should lift up those who’ve been disproportionately targeted by the drug war. Legalization advocate and rapper Killer Mike, whose birthday happens to coincide with the cannabis holiday, said in a press release on Friday that 4/20 should remind people of the need to decriminalize cannabis. Democratic members of Congress scored points for correctly answering questions about marijuana during a trivia game at a retreat they participated in last week. The cannabis quiz was part of a bond-building exercise designed to unite the party around shared legislative goals. The category in question was reportedly titled the “Green New Deal,” a play off climate change legislation that Rep. Alexandria Ocasio-Cortez (D-NY) is championing. But these questions concerned a different kind of green matter. The marijuana queries weren’t especially policy-oriented, though, according to one reporter who got information about how things went down. Instead of questions about various cannabis bills that have been introduced in the 116th Congress, they tested lawmakers’ cultural understanding of the plant and how it is consumed. Trivia finalists Ocasio-Cortez and Reps. Katie Hill (D-CA) and Ruben Gallego (D-AZ) made it into the cannabis round, according to Politico’s Heather Caygle. 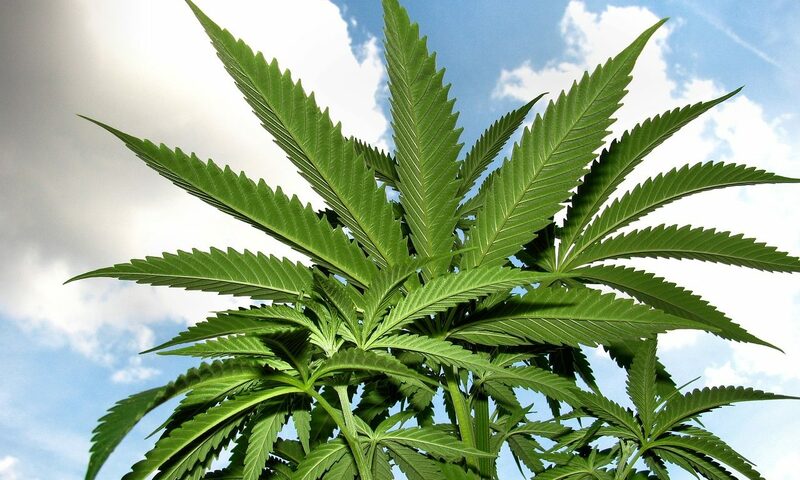 The two congresswomen correctly identified “sativa” as the answer to an open-ended question about variants of marijuana. But Gallego was ultimately victorious, answering a question about a type of device that uses water or air pressure to quickly draw smoke. Caygle wrote that the question was about a “gravity bomb,” but clearly she meant gravity bong. The trivia category is the latest in a series of signals that marijuana is a popular topic among congressional Democrats. At the same time, some members like Rep. Barbara Lee (D-CA) have emphasized that the issue isn’t a laughing matter and should be discussed seriously. But reform advocates can nonetheless rest assured that cannabis is fresh on the minds of Democratic members as they take their two-week recess—and that at least some of them know their marijuana products.